With this mug and this shower gel, you have the perfect way to say "Happy Holidays!" this year. This duo features the fan favorite gel formula, infused with the creamy scent of hot cocoa. In this new exclusive, philosophy paired it with a signature philosophy "hygge" mug, the danish way to express that special warm and cozy feeling that's especially present around the holidays. So curl up, relax and revel in the sweetness! Included is the award winning formula that gently cleanses and conditions from head to toe. Extra rich and creamy formula for gentle enough for every day. 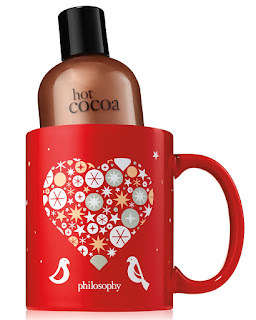 Festive holiday style, limited-edition scent plus extracts exclusive to the philosophy mug. To use: apply to wet body or scalp. Lather, rinse, repeat if desired. If using as a bubble bath, drizzle a generous amount under running water and enjoy. Even though it is normally $18.00, today all philosophy items are 40% off with the code: blackfriday40. The philosophy hygge mug & hot cocoa shower gel set will still be available until supplies run out. These sets are available at www.philosophy.com. Like philosophy on Facebook: https://www.facebook.com/philosophy; Follow philosophy on Twitter: @lovephilosophy; Follow philosophy on Pinterest: https://www.pinterest.com/lovephilosophy/; Follow philosophy on Instagram: https://www.instagram.com/lovephilosophy/ and Subscribe to philosophy on YouTube: https://www.youtube.com/philosophy.